But reality crashed the party. 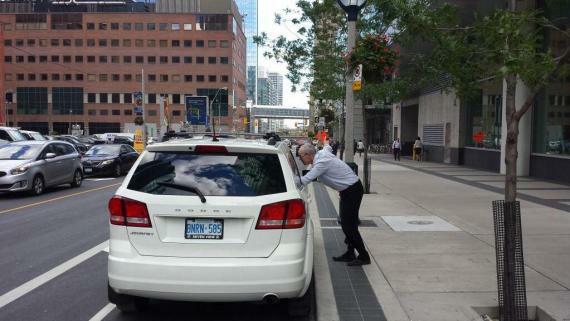 Dan Egan, Manager of the Cycling Unit, telling a driver that the fine is $150 for stopping in the bike lane. East side of Simcoe, south of King: in front of St Andrews Church. I see a sign telling drivers that stopping is verboten. But where's Dan to explain the finer details? Car blocking the southbound Simcoe traffic lane right next to available parking. Seriously, they could have just parked right next to it and it would have been totally legal. But with no physical separation I can understand why the driver is confused. Nothing scientific? What about the last twenty five years of bike lanes? Is that not enough to convince you that enforcement doesn't work? Every year the cops would conduct a ticket blitz in the spring. Didn't make one iota of difference in driver behaviour. "Some people"? Were they born yesterday? It would either take diverting cops from other areas or hiring more cops; cops dedicated to bike lane enforcement. About as likely as Rob Ford going cold turkey. Oh, Toronto is definitely not the Only City in the World without protection. Just down the QEW in Hamilton, we've got it worse. How about a 2-way bike lane on a 1-way street without any physical protection? What if I told you that the lane actually stopped for 800m, right in front of the Go Station, forcing contra-flow cyclists to make a scary left turn across 2 live lanes of oncoming traffic just to get to a street that they can take to get over to the part where the lane continues? Yeah. That happened, and continues to happen. So you don't have it that bad. Although, to be fair, we are getting a real Cycle Track this year. Go Hamilton! Though to try to garner your sympathy again, did your city promise you cycle tracks and then just give you paint? Raising expectations only to crush them can be worse in some ways. Maybe the pain is lessened that staff are saying they will put in bollards if their experiment is a failure, but they'll get to define failure—maybe they're okay with bike lane blocking 15% of the time when the cycling public prefers 0%—so there's that. It's an unfortunate coincidence that just as I pass the driver door handle of cars parked in the bike lane that I need to clear the traffic-pollution caused phlegm in my throat. So sorry. Every time I have ridden Simcoe there were cars blocking it. I have yet to see a single parking cop. What enforcement? The worst part is large vehicles blocking the contra flow lane. Forces riders into oncoming traffic. 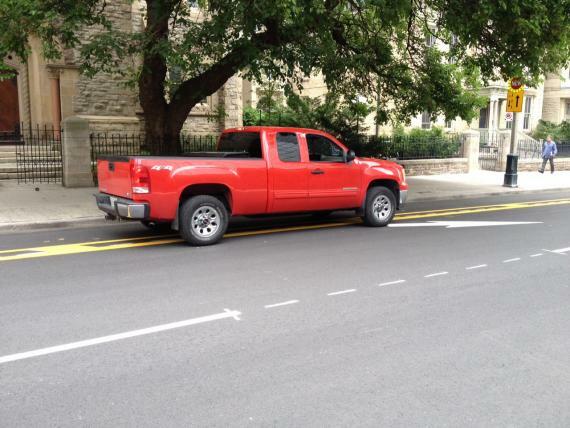 I sent a bunch of pictures of lane blockers to every councillor on PWIC and asked for immediate bollard installation. I suggest we flood their inboxes. Thanks for doing that Laura. Thanks for doing that Laura. Feel free to share a link to your photos if you have it handy. Emails include the interim councillor of Ward 20, the chair of PWIC, Councillor Layton who chairs the informal cycling committee, Stephen Buckley, Transportation Services General Manager, and Dan Egan, Manager of the Cycling Unit (these last two likely made the decision to test the "paint-and-enforcement-is-enough" hypothesis). You can also send a tweet and mention @m_layton, @cetar, @to_cycling. It looks like you need to push for some protection. It would be cheap to add some skinny concrete curbs where the painted buffer is now. But let them do their trial and give them lots of feedback on what's working and what's not. This type of painted buffered lane can be easily upgraded in the future when you have a more bike friendly council in power. asking for enforcement is a joke. On Shuter last night (a typical afternoon), 2 police cars, an ambulance (not active), City of Toronto work trucks (static- they are blocked off and take up about half a block), 2 SUVs, a cement truck, half a dozen taxis... and that is off the top of my head - on Shuter street from Yonge to River - and that is ALSO my experience on Dundas. They may "pretend" to enforce Simcoe for a bit, but guaranteed it will go the way of ALL the unprotected bike lanes in this city - to hell. I concur paint doesn't work. I concur paint doesn't work. 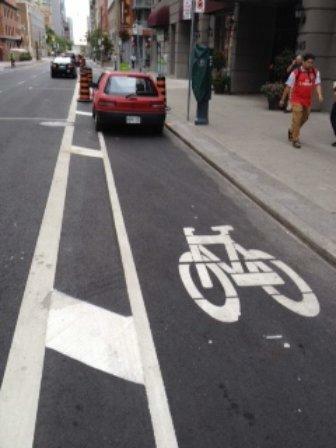 I see if all the time, cars parked in dedicated bike lanes. I wish I had a direct phone number for parking enforcement in each downtown zone. Sitting on 311 just to report them is a nusence. Maybe the city could allow civilians to photograph the offending vehicle's license and ticket based on the photo. Heck, they should make that a feature in their new cycling app. Bring back those old photo radar machines and figure out how to modify them to take photos when a lane is blocked. New CCTV software allows you to record and filter out movement, capturing only stopped vehicles and their license. I understand the snow plow issue and I'd be more willing to give up plowing in exchange for a row of parking lot curbs, placed along the line. Maybe the city should consider a double wide lane for two flows of traffic or to support motorcycle /scooters and a lane for bikes. Bi directional separated tracks on one side of the street (east side) would be safer...as to not have incoming traffic face unprotected north bound cyclists. Phone number for parking enforcement is 416-808-6600. Save it to contacts, and report report report. A community liason officer told me one of the factors in determining what the police will "blitz" is the number of reports/complaints, so lets flood the lines! If the city were to install bollards, how would the TTC store long sections of streetcar track in the bike lane for months on end? you're right Laura! And where would all those bloody movie trucks park?